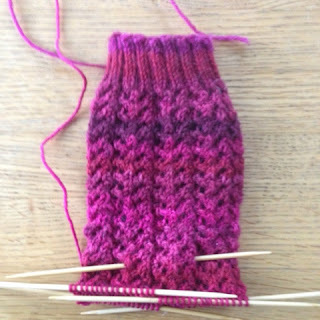 Yes, this is the same sock from last week, but I am now nearing the toe! 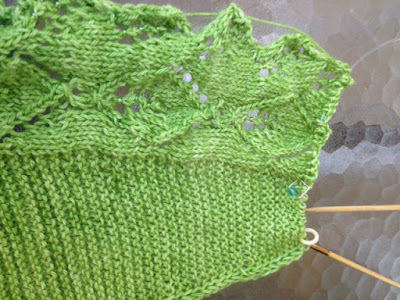 It does feel good to finish old projects -- though, it lacks the kick we knitters get from casting on! 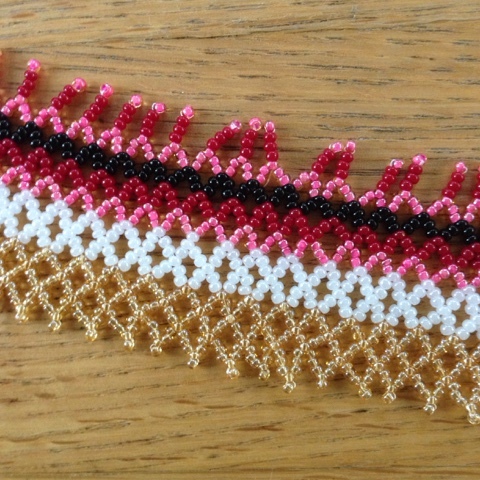 I also finished the Garland Shawlette started in 2013 and will try to get it blocked and photographed soon! 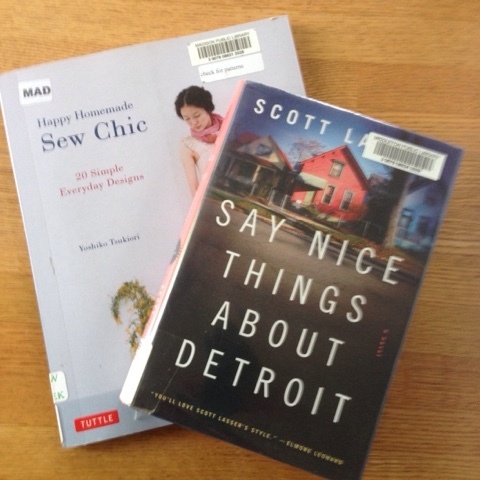 I found these two books at the library! Both are relatively new books that I've been wanting to read. 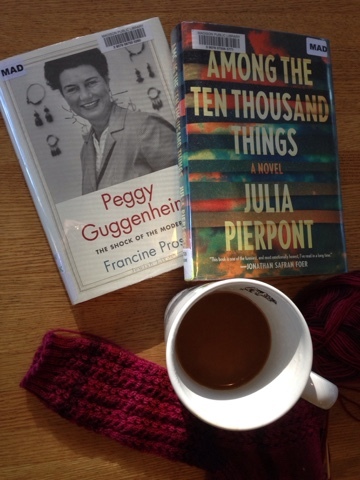 Among the Ten Thousand Things by Julia Pierpont is a novel about the fallout in a family after the husband's affair is revealed. I'll read pretty much anything by Francine Prose, and art collector Peggy Guggenheim has always interested me. She lead quite the bohemian life in the mid-20th century. 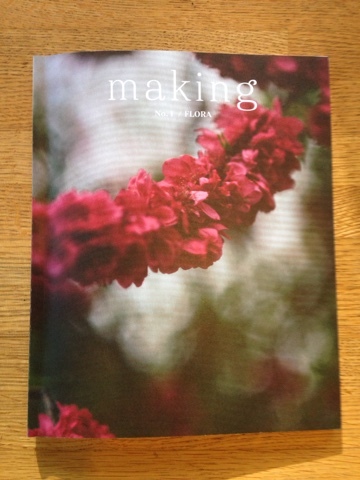 I'm also reading the first issue of the making zine, thanks to Rose. I think the only way to get your hands on this beauty is to order it from Carrie Bostick Hoge's web site. It is totally worth it. The sweater patterns are to die for! I've only perused it so far, but I'll report back when I've had the chance to soak it in. I'll be joining Ginny for Yarn Along. Can you believe she's pulling this off with a brand new baby? That woman is amazing! I'm not sure how I got off-track with this. 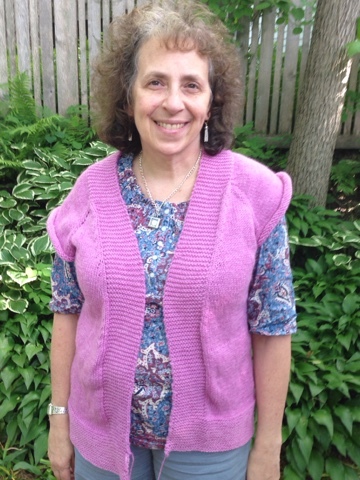 It is a beautiful design by Michelle Bernstein, who writes a great patterns. It took me more than an hour to get going on it because there are three sections and beads, but it was totally worth it. I can't wait to wear the finished shawl. 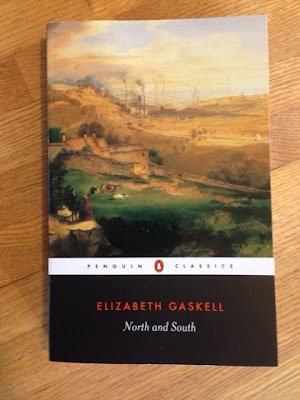 I'm still enjoying Elizabeth Gaskell's North and South. It is amazingly contemporary with its theme of wealth inequality. I'd never seen one of these in real life, but Keith spotted a whole group when he was biking and drove me back later to see them. My last few days in Door County were slower than usual thanks to a sore throat and body aches, but I still enjoyed them. Door County has become Keith and my little piece of paradise. We come up here every summer for a few days and unwind. We ride our bikes, poke around the art galleries, and hang out at the little cabin we always rent. Yesterday we went to lunch at one of my favorite restaurants, The Cookery. 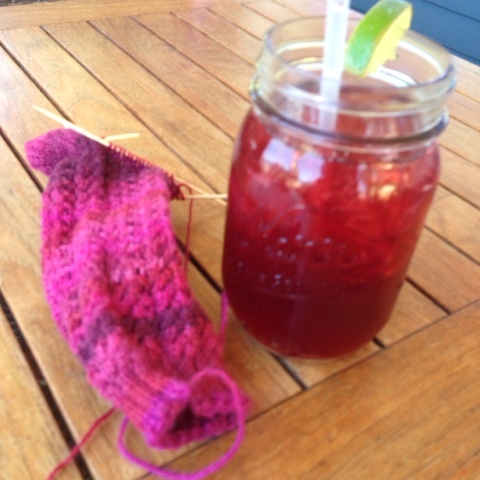 I had a Cherry Sparkler, which matches my Trellis Socks pretty well. Door County is cherry country, and we always have a few breakfasts at Julie's in Fish Creek, where the cherry crepes are amazing. 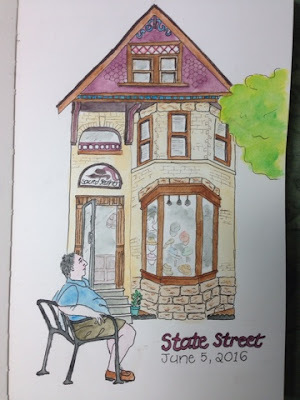 Now I always think of Kathy, who likes to stay, as well as to eat at Julie's. One of our favorite galleries is the Edgewood Orchard Gallery, which features a sculpture garden. This huge piece is called "Wooly". Nicole, I so hope that you find your cat! In the meantime, I'll be at your link up. I am sure I am not the only teacher -- or employee of any type -- who feels that real life only happens in the summer. School is just so overwhelming. This last week has been magical. I can take life at a reasonable pace and do the things that are important and that I love. Today I had a refreshing bike ride in the cool morning air and ended up at my parents' community, where I had breakfast with them. 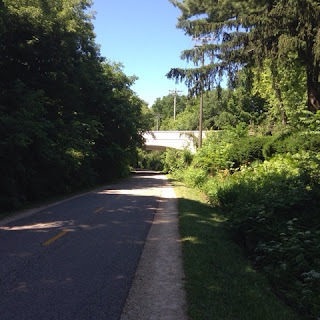 The bike path near my house. Twenty inches of this and I'll be done. Do you see a lot of pink today? I cooked a recipe that I've wanted to make for ages, the enchilada recipe from the Oh She Glows Cookbook -- a book I learned about from a blog friend, perhaps Nichole of Frontier Dreams? 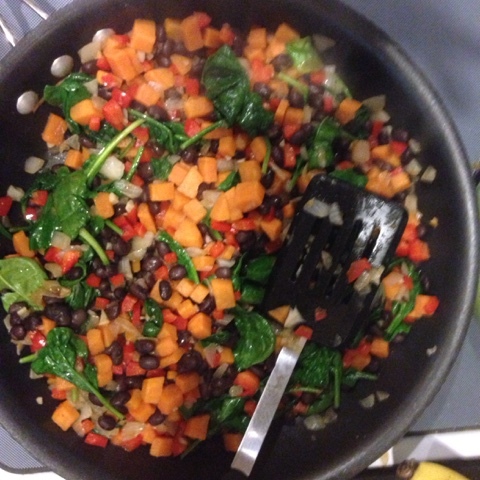 The filling features sweet potatoes, black beans, and spinach. Really amazing dish. I spent time weeding the yard, decluttering the house, and even doing paperwork for school. But without the frantic pace and demands of school, it was all enjoyable. There is something terribly wrong with our modern life. Americans work more hours than any other people in the world, and we pay a terrible price for it, both physically and emotionally. I wish there were more jobs that allowed Americans to have a life! I am grateful for summer break. 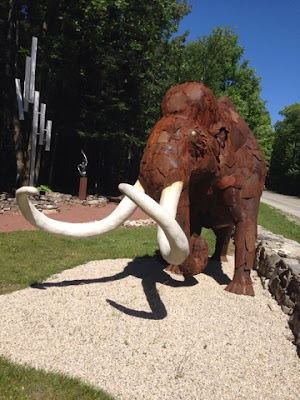 Tomorrow Keith and I take our annual sojourn to Door County, the "thumb" of Wisconsin. The weather forecast calls for warm, sunny days. I hope your weekend is filled with blue skies and fun. Thanks for all your sympathy and thoughts on my aching hand. 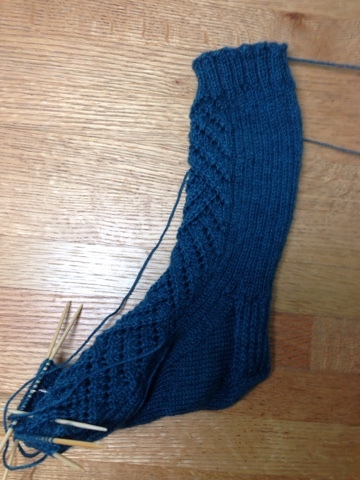 I've mostly laid off knitting for the last two days, other than a few rounds on this sock, which is my own Trellis design. Kathy suggested trying socks with wooden needles, which seems to be fine. I don't know why, but the magic loop technique, which I like, seems to be causing the pain. I'll have to finish the sweater a little at a time. I'm afraid if I switch to dpns, the gauge will be different. Since I don't want to knit much, I've been doing some bead work. This is the beginning of a collar-style necklace. I'm not thrilled with the colors, so I think I'm going to go back to the bead store and try something different. I took a short break from North and South to read Say Nice Things About Detroit by Scott Lasser. I've lived most of my life in Rust Belt Cities, so I enjoyed the ambiance. It's a good summer read. I've also been looking at sewing books influenced by Japanese styling. Don't ask me why. I am a terrible seamstress! But I'd like to get better, and some of these items are pretty easy. The downside of easy is that some of them are hideously ugly. Who knows? Maybe I'll find something even I could make. Is This Why It Hurts? I've been knitting great guns on my Harvest sweater, using the magic loop technique, which I really like. However, for the first time ever, my right hand and forearm really hurt. Could it be that something about the way I'm holding that long needle is causing the pain? 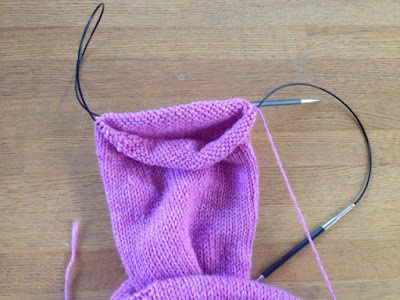 I'm not knitting more than I have at other points, so I don't think it's an issue of too much knitting. Has anyone out there found that certain techniques hurt their hands and/or arms? 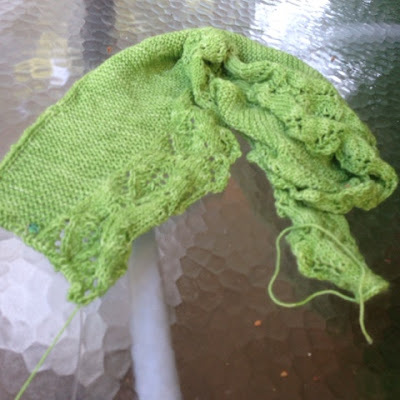 Here it is the first Monday of spring break and I feel like I have to lay off the knitting. While that is kind of a bummer, it isn't going to ruin things for me. 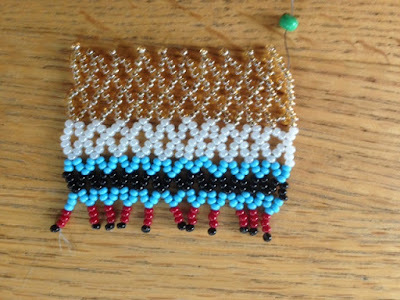 One advantage of having so many crafts, is that I'll just turn to embroidery or beading. I'm sure I can find something fun to do. Besides, my house is in chaos, so decluttering is on the agenda for the entire summer. And so is work! After 10 years, I have moved on from 8th grade. In the fall, I'll be a special ed teacher at a high school. I'm excited about a new challenge and older studentws. It doesn't hurt that the school is a half-mile from my house. Both my children went to this high school, so I know a lot about it -- and it is a great place. I'll be heading over there this afternoon to meet with my new boss. I've known her for years, and she is an excellent teacher. Wishing you a pain-free week! First things first: My mom's pacemaker surgery went well and she was able to go home the next day. She has had a lot of surgeries in her life, and she is quite a trooper about them. My Harvest sweater actually fits! After three completely disastrous attempts at sweater-making, I am as surprised as I am happy that this one is working out. Now I just have the sleeves, and I can't believe they won't be relatively easy. I took a ton of Victorian lit classes when I was an undergrad, but it has been a couple decades since I read one. I haven't read Gaskell before, so I didn't realize that she is easier to read than Dickens or Eliot. I'm sure one of the reasons I was drawn to this book is that one of its themes is inequality. As a teacher in an urban school, it's hard not to focus on this issue. 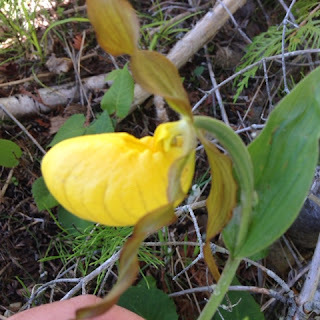 Despite predictions for rain, we had a dry and sunny weekend. I should have been weeding and trimming hedges. Instead I went to some open studios with friends and worked on the screened porch. I've made good progress on this sock, but I've put it into hibernation. 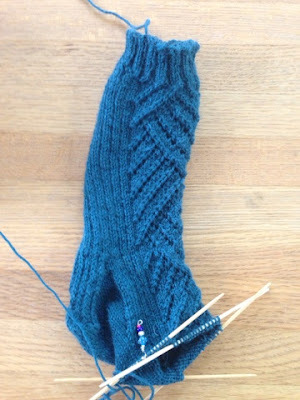 I can't find the second skein of yarn, which just killed my desire to even finish sock #1. It will turn up eventually. In the meantime, I've decided to finish the second sock to a different pair. I went out on the bike -- something I have to do more. 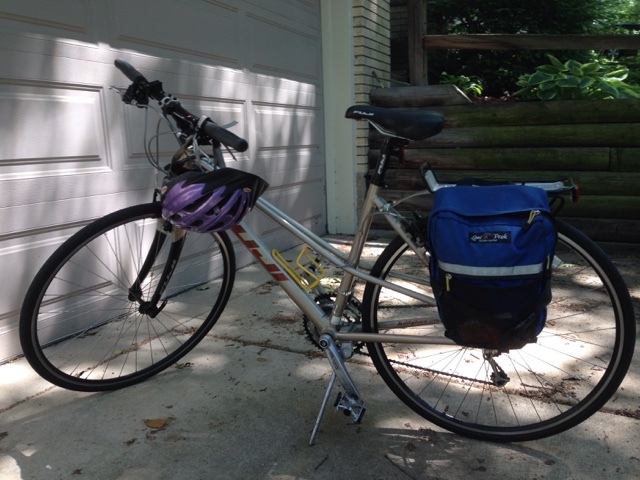 My feet problems limit my walking, but I can bike just fine. 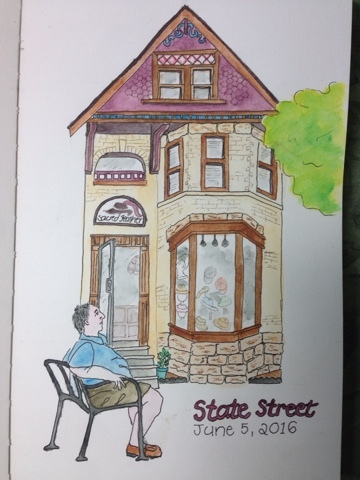 While I was out biking, I stopped to finish this sketch, which I started last weekend. Tomorrow my mom is having surgery to have a pacemaker inserted, so keep her in your thoughts! 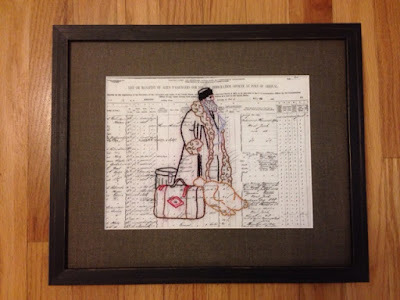 Last night the Jewish Artists Lab had the opening for our art show. A member who is a poet started it off with a spoken word performance, and then people milled around and looked at the works. We got a nice turnout, so it turned out to be a lot of fun. 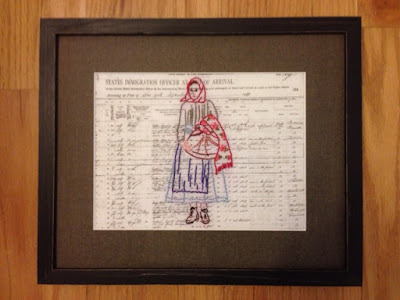 Native Americans from the Plains began painting on ledger paper after buffalo became rare and then extinct. So, I replaced the ledger paper with the ship manifest and the Native American drawings with Jewish themes. 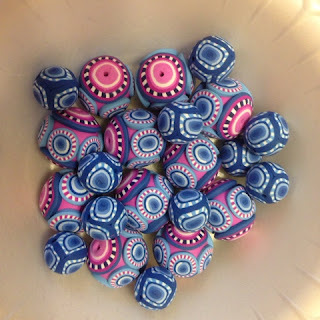 People seemed to like them, so that made me happy, too! I'm in a pretty good mood this morning. There are only 8 more days until summer break! The art show I'm in opens tomorrow night. And I'm enjoying my knitting and reading. I had lost my place on the Winding Way socks, thanks to a Post-It Note that had lost too much of its stickiness. I figured it out over the three-day weekend, and now it's moving along smoothly. I realized that it's a Tin Can Knits pattern -- which is the same designer as my sweater, Harvest. That's coming along smoothly, too, but I thought I'd give you a break from photos of endless pink! 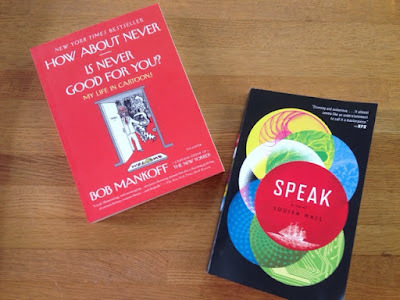 Speak by Louisa Hall reminds me of some of David Mitchell's books because it ties together people from across history, some real and others fictional, who are struggling to tell their stories in various ways. Unlike a Mitchell novel, though, it is fairly short. A good summer read. How About Never? Is Never Good For You? doubles as Bob Mankoff's autobiography and an inside look at the cartoons in The New Yorker. Also an entertaining read! I'll be joining up with Ginny to Yarn Along.